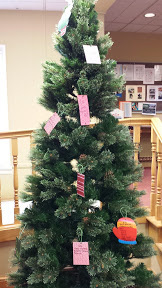 Each year, Christ Church continues it’s tradition of Christmas giving through The Giving Tree Program. This project allows parish members to help those families in need right here in our own community. Necessities such as clothing and household items are detailed on decorative tags which hang on two Christmas trees located in both the Parish Hall and the Narthex at the entrance to the sanctuary. Please sign out a tag (or two! ), purchase the item on the tag and return this much needed gift to a nice spot under the tree wrapped with tag attached to the outside. These gifts are a wonderful way to share our blessings and help our neighbors to have a Merry Christmas! Thank you for your generosity!